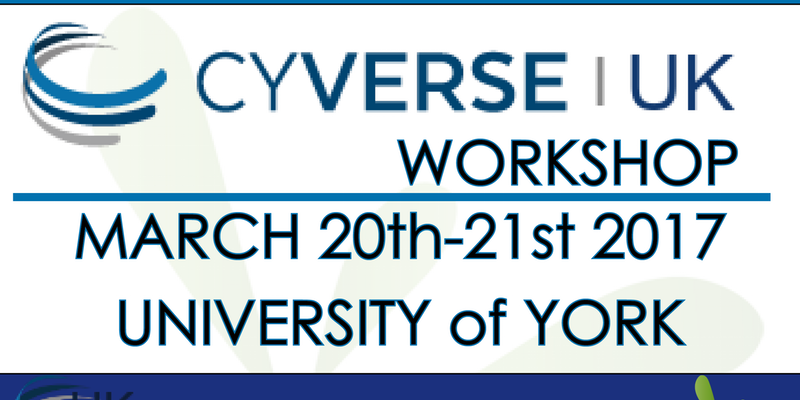 In addition we will host a concurrent track for more experienced bioinformaticians who wish to learn how to use CyVerse to host their own programs. This is the Intermediate Track. The concurrent tracks will run in separate rooms. These software tools have been developed as part of the CyVerseUK grant. We will also highlight the opportunities that exist for the sharing of big data in a meaningful manner. This workshop is organised by GARNet with Professor Katherine Denby at the University of York. There is accomodation available on a first come-first serve basis at the University of York bed & breakfast facility, Franklin House. - This is bookable online through the URL www.yorkconferences.com - Select the Accommodation tab, click 'Bed and Breakfast' and then onto 'Book'. Dietary Requirements If you have any dietary requirements then please can you email Geraint at geraint@garnetcommunity.org.uk with those details. We will send out information about the workshop dinner closer to the time. Please bring a laptop to the workshop for the hands-on portions of the sessions. Closer to the time we will send out the data that we will analyse at the meeting. Please sign up for a CyVerse account. You can register at https://user.cyverse.org/ and we recommend that you take a brief look at the website before you attend the meeting. Please ensure your computer is registered with the EduRoam network. If this is not possible we will provide some Guest Logins for the duration of the workshop.